Discover the Fite Eye Center difference, where superior skills and knowledge combine with a friendly, comfortable environment. “We provide optical services in our offices. As long as you are in our care, we want you to be confident with your eyewear choice. With years of extensive and professional expertise in the eye care industry, The Optical Shop continues to strive to earn the trust of its patients and the community. Our opticians are trained to help you select the proper frame for your prescription, as well as help you select the best style and brand of glasses for your lifestyle. We offer the finest state-of-the-art lenses and coatings available. Crizal® Anti-Reflective Lenses - virtually eliminate glare and great for night time driving by eliminating headlight glare. Varilux® Progressive Lenses - (no line multifocal) - are the nearest to natural vision. They can create a sense of constant clarity at all viewing distances. They are ideal for all first time multi-focal lens wearers. Transition® Lenses - automatically darken in sunlight and lighten indoors, allowing the wearer the convenience of one pair of glasses for indoors and out. Xperio® Polarized Lenses - eliminate all indirect reflection such as from water or snow, allowing greater depth perception and visual acuity. Excellent for many sports including boating and skiing. DriveWear® - the first changeable polarized outdoor lens. It darkens outside as well as behind the windshield. This lens reacts to all different outdoor weather and light conditions. High Index (Thin Lenses) - are considerably thinner and lighter lenses. They weight much less and are much more comfortable to wear. U.V. Filter - is highly recommended for its ability to protect the retina from the harmful effects of ultraviolet light, and for the reason is also required for all post-operative cataract patients. Polycarbonate Lenses – are the most impact resistant lenses. They too are made of a thinner, lighter material. The use is recommended for children under the age of 14 because of the superior safety features. Computer Lenses - if you’re viewing a computer video display terminal (VDT) you may need variable focus lenses. These help correct vision for the computer screen and the immediate vicinity. 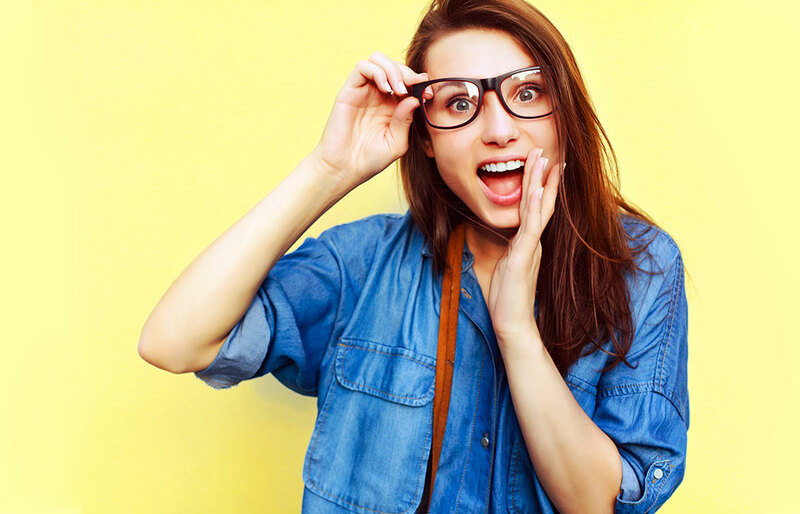 Everyone has different needs when choosing eyeglass frames. Proper fit and a style that suits you are probably the two main objectives. Your face size and shape, hair and eye color, and other factors affect your decision. To make the best selection, you need a good understanding of what constitutes “proper fit.” This will affect how your glasses look, whether or not they are comfortable, and how well you see with them. Our optical professionals are specially trained to assist you with your frame selection. We carry designer frames including: Coach, Calvin Klein, Versace, Anne Klein, Timberland, Columbia and Flexon. Click the Eyeglass Guide for an interactive tool to help you understand the many types, benefits, functions and features available in today’s lens options. Several years ago, Consumer Reports did a study of patient satisfaction with their eyeglass makers. They found that by far the highest rate of patient satisfaction occurred when patients utilized optical dispensaries located within their ophthalmologists office. For this reason, and because we feel that our carefully determined prescriptions need the best optical services, we have put a tremendous effort into making our dispensary the best place for our patients to obtain their eyeglasses. At Fite Eye Center we strive to provide excellence in eye care in every phase of our practice. And this includes our optical department, we want every patient to be completely satisfied with the eyewear they purchase. So we offer you our Patient Satisfaction Promise. It means that we promise to do everything possible to make sure that you’re satisfied with you new glasses. If for any reason you are not satisfied with you new lenses, coatings, or frame, we will replace them at no charge to you. It’s as simple as that. So, please tell us about any problems or dissatisfaction you have and we promise to do everything we can to remedy the situation. The most important reason for our Patient Satisfaction Promise is that when you’re happy, we’re happy! Our Optical Services Designer Eyewear Computer Eye Wear Special Lenses Technology Children’s Frames Our Satisfaction Promise.